You know time and time again I receive friend requests from Businesses and I am always torn, because often I do want to be friends with the owner or whoever might be running the account, but at the same time I feel like I am encouraging someone in a self-destructive behavior, it is like saying to your friend, sure fruitcakes are coming back into fashion, you should send them to all your client. Fan pages let you track your impact on Facebook, they are designed for advertising, they even let you see the impressions on each post you put up. If you are looking to build your business shouldn’t you have a way of measuring the metrics of whether or not you are making any impact, at least I always thought so, but those of you using personal profiles for your business are probably right, you’re probably better off being in the dark, not having a clue if anyone is reading your notes, forget metrics, they are over rated. Every time I hear someone talking that the personal profile is the way to go for business, I expect to see them on this list “Top 87 Bad Predictions about the Future” . I was fortunate to score an invite to Rockmelt early after its launch and I have been playing with it to give those who have not had access to it yet an idea of whether or not they should be chomping at the bit for this new toy that is teasing us all with the “invite only” method that Google tortures us all with when they release any cool new application. First I have to say I am not knocking the method of launch, I think it is sheer genius as it builds excitement and gives the company a chance to ramp up the application, making sure that it is sound. The risk is that no one wants to see the general public react to their product like Google Wave, which even though I love it, was not worthy of such buzz. In the case of Rockmelt, I also put it on my 14 yo daughter’s computer, and she fell in love with it, because of the way it keeps your social media content at the tip of your fingers. She could easily chat with her friends while continuing working on the site she was on. The browser shows on the left side which of your Facebook friends are online, and can be set to just show you “Favorites”, on the right you can place quick links to your social media feeds, and it will show you the number of new updates as well as give you quick access to pop up sidebars to review those feeds without leaving the website your on. The benefits of this browser, it makes it easy for anyone to stay on top of their social media feeds without having to have multiple browser tabs or windows open. The twitter feed seems to be limited to your full timeline or your mentions, I have not yet found a way to post list feeds to the sidebar yet, hopefully this is my short fall and not the browsers, as without the ability to track specific lists, you need to deal with the entire timeline, which isn’t bad if you aren’t following more than 100 active individuals. The short coming of Rockmelt seems to mostly affect those of us with large twitter accounts and multiple lists, or multiple twitter accounts under our management. 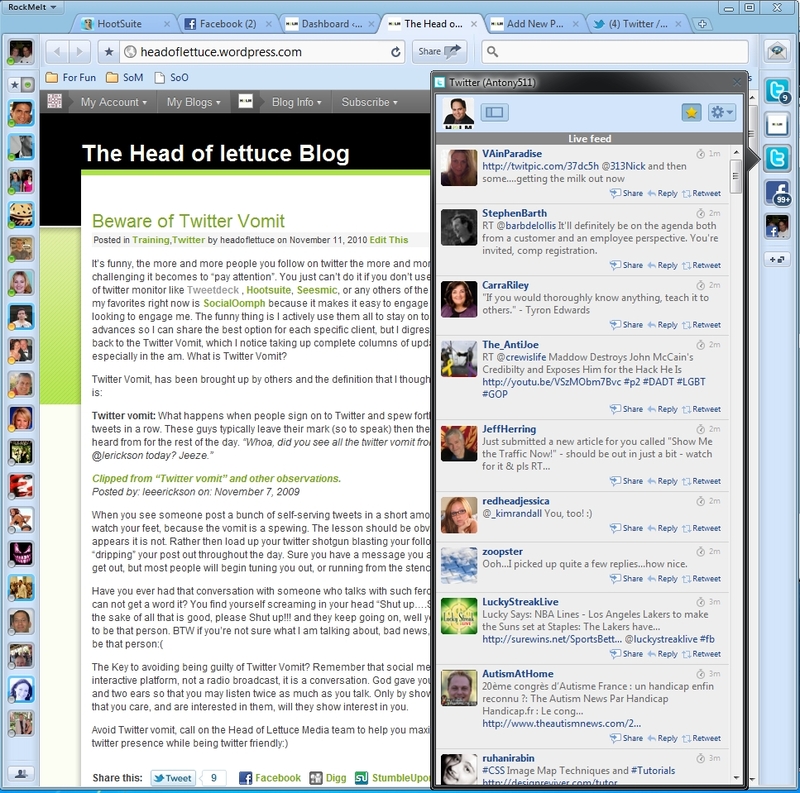 However I still like using it as a frame for my Hootsuite. Over all I think the browser is great for most people. Working on a social media audit for one of our customers here at Head of Lettuce, and it brings to mind how few companies know the answers to such important questions like: What percentage of the company is on Twitter? What percentage is on Facebook? 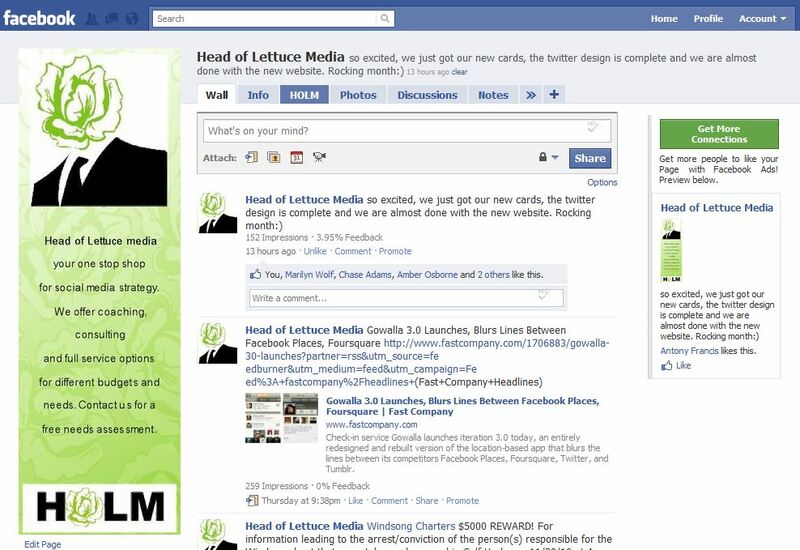 How many have fanned the company page? These questions are necessary for any organization to know the answers to, and how to deal with the numbers no matter the mix. What if you have a significant number of employees on social media, how do you monitor them? How do you protect your brand name? How do you prevent inadvertent slips? These are all important parts of a successful social media strategy. It is often said in management that you can not move forward without a true understanding of where you are, well you better figure that out. I’ve noticed that once the executive team of an organization begins to understand the risk as well as the benefits of social media they embraces it and want to understand as much as they can. It is up to social media companies to help businesses realize this. Social media is a disruptive innovation that is changing the way we do business and communicate with consumers. Much like e-mail made it easier and cheaper for an organization to maintain a large mailing list, Social Media is now creating relationships sought out by the consumer. Consumers want to interact with businesses as they often feel like they are on the same team as the business. We saw a great example this week, where an overzealous fan of one of the companies we are working with, is using the company logo on their FB profile, making it look like they work for the company. This is a great problem, because this individual is that big of a fan of the company. Obviously a company can’t have this because of the inherent risks, but the intent of the customer is truly one we should all hope that all of our customers look to duplicate. A good social media audit will uncover all kinds of “challenges”, but that’s the goal. Issues like the one I described going unchecked could result in a much more expensive result for the organization. Have a business that you are concerned about your social media interactions and employees involvement, contact us to discuss how we can help you. All I can say is what a busy month it has been. The Head of Lettuce has been shot out of a cannon and is accelerating to light speed, we are working on some amazing business alliances, products and services. This month a common theme kept coming up in conversations and that is, We are not an advertising agency and we are not a PR firm, nor are they a Social Media company. Advertising agencies are specialist in broadcast messaging, one way messaging like tv, print and radio. PR agencies help you develop the message you would like out there. Social Media companies like us, well we help you enter the conversation about your brand, the key word being conversation. Social Media companies, at least the good ones like us :), work the different mediums and understand that there is a two-way conversation going on. They understand the etiquette and will translate it into understandable bite size pieces so that you will too. Weather or not you have time to do what is necessary is another issue, and that is where we come in. We have the experts who can do it for you, and if you have special needs outside of our staffs ability, we bring in the expert right for your needs. One of my biggest pet peeves are the people entering into social media, representing themselves as an “expert” or even a practitioner, and yet they publicly make mistake after mistake. I’ve seen companies and individuals claim to help people with social media, and all they do is broadcast, broadcast and broadcast some more. How can you spot these impostors? simple, try to engage them, mention them, tweet them, see if they answer, see how long it takes. Have them explain social media to you, and trust your gut. We offer free sit downs with any business considering out help, and more importantly offer no pressure, if we are right for you, you will know. One of my favorite sayings is “If you have a product worth selling, it will sell itself”. Can Twitter tell what kind of Lover you are? I am always concerned when watching my account numbers grow as I want to make sure I engage anyone reaching out to me, does that make me needy, I don’t think so, i think it makes me a person concerned about your experience as much as my own. What about people pimping their business non-stop all day with links? or those following everyone, but with no one following them back. Curious to hear your thoughts on this, don’t be afraid to have fun with this. Swarm, Herd and Mob behavior in Social Media? For a few weeks now I have obsessed over the applications of Swarm, herd and Mob behavior and how they might apply to social media, and I believe there is something there worth striving to understand. I believe that how people behave online might follow these theories. Swarm behaviour or Swarm Intelligence discusses how working together the group is smarter and stronger than the individual. This is demonstrated by insect swarms, where the individual insect is not intelligent, but collectively they can carry out some pretty amazing/destructive things. I believe that swarming can be one of the causes of topics trending on twitter. In April of this year we saw a swarm with the creation of #4SQDAY. Consider only 3 weeks before 4/16/2010 no one ever thought of a “Foursquare Day” see the story here. With 4SQDAY we saw an idea’s inception that was shared with a core group via twitter, that group then then focused their attention on getting this idea “out there” and the collective bit on it. We then saw this idea grow in 3 weeks to 250 cities throwing parties in at least 35 countries. Don’t find this impressive, try planning just 10 parties in ten cities in 3 weeks. Herd behavior discusses how individuals act in a similar pattern to those around them, much like a flock of birds. This Herd behavior can be seen in the stock market where individuals look to see how others are acting, and without thinking about it, mimic their behavior. On Twitter, herd behavior would be one probable cause of people re-tweeting trending topics, causing them to continue to trend. “It’s what everyone is doing”. Mob behavior however discusses people being motivated to act in a fashion outside of their character, because they are swept up in the moment with others demonstrating that behavior, this is accountable for why people buy impulse items when they see others buying those items, even if they never intended to buy those items. On Twitter, mob behavior may be an explanation for people who jump on board attacking a company or brand online. Today while researching a company that I am meeting with next week I noticed that they were promoting a “big announcement”; after the announcement I noticed a quick mob joined in after the first negative remark, people jumped in on the company, and my guess is that some of those people only jumped in, because they saw others doing it. The question now, which I hope to investigate and find out, is can behaviors such as these be artificially created, can they be focused, once focused, can they be dispersed or redirected in a new direction. I am looking for any and all ideas on this, so please chime in. If you have any examples of any of these behaviors, add them as a comment. I hope to have a follow-up to this article, including what I learn. I had a friend ask me a good question about my @HOLMedia account & my @Antony511 account, are they going to be redundant, and at that moment I was not sure my answer on that, but I think I have figured it our. @Antony511 is me, good, bad and the ugly. It is where I talk about everything and anything, which also includes my business, social media. 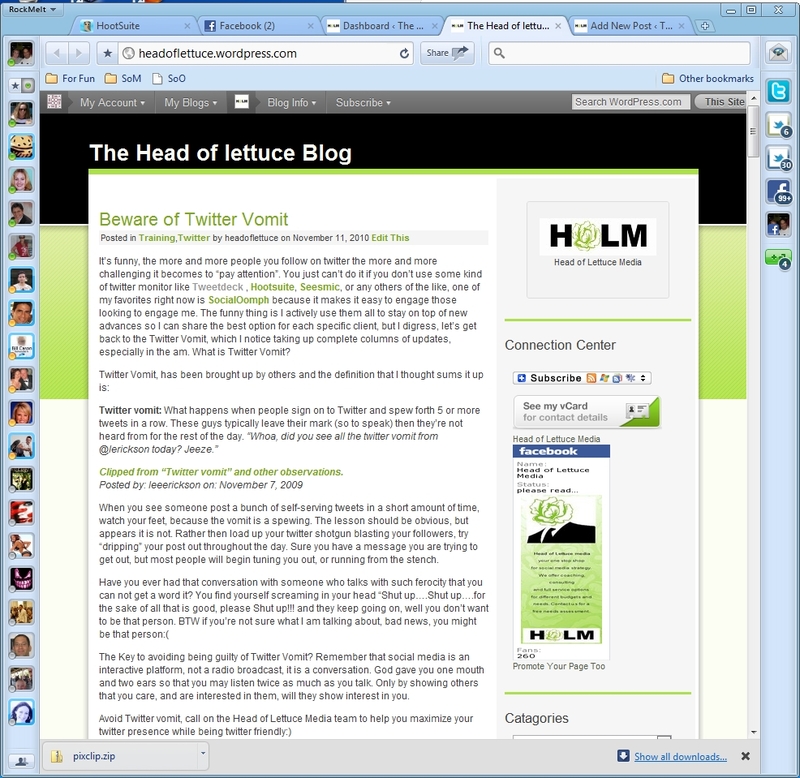 @HOLMedia is my company account that I expect to be more focused on social and new media conversation. So the question is, is there a benefit to following both, and the answer is no, at least not now, as most of the stuff that @HOLMedia tweets will also be shared by @Antony511, but not everything I do in my personal account will be shared on the company site. So if you are a friend, stick with @Antony511, it is who I am. If you are only looking for what I share about social media, then you really only want to follow @HOLMedia. Today I was witnessing some tweets from people who just don’t get Twitter. I don’t follow you so I can get your daily plug, a link to an identical post on Facebook or what amounts to spam. I want to interact, I want you to engage me, I want you to acknowledge when I tweet you. Lisa Barone discusses two points in her blog post 6 Ways to Lose Customers, Credibility & Friends On Social Media under ignoring your audience and auto spam; great article in general. While I am discussing the things I hate on twitter, I found another article by Naren Ubi that hits a bunch of my pet peeves, Top ten tweeter-types you must NOT follow on twitter with the biggest pet peeve of all being people who do not interact. Why be on social media if you are not going to be social, no matter what you think, you are not that interesting.